The early beginnings of St. Pius V date back to the mid -1850's while Minnesota was still a territory. Catholic Irish immigrant families settled in the western section of Goodhue County in the vicinity of Cannon Falls. Several missionary priests served these Catholic settlers throughout the length and breadth of Goodhue County. In 1856, two years before Minnesota became a state, Father Felix Tissot was assigned the Goodhue County Missions. Due to a rapid increase of immigrant Catholics to the area, Father C.J. Knauf became his missionary assistant in 1859. In 1860, Father Pius Beyers (Byers) celebrated one of the first Masses in the home of Mr. and Mrs. Frank Wise (Weiss), a part owner and operator of the old flour mill on the Cannon River at the north edge of town. In 1861, he also purchased about two acres of land from H.A.Van Campen, the present St. Pius V church site. For four years following, Mass was celebrated every three months at the home of Mr. and Mrs. Morris Hartery (presently 301 4th Street). The Hartery's were one of the first families to offer their home to the missionary priests when they came to Cannon Falls. When the missionaries came to Cannon Falls, the family provided a room, home cooked meals for them, as well as stabling and feeding the missionaries' horses. As the number of Catholic families grew, a larger place of worship was needed. In 1864, Father John Ireland set the cornerstone of the Mission Stone Church built of limestone quarried from Limekiln Hill, which later became the site of the first rectory. Men of the parish mixed and carried mortar for the stonemasons of which George Bremer, Sr. was one. The walls were built; however, the windows, doors and floor were not installed immediately. Due to the Civil War, there was a lack of lumber and finish-dressed millwork, such as doors and windows. These came from St. Paul by boat to Hastings and then hauled by teams of horses to Cannon Falls. After two years of construction, in 1866, Rev. Pius Beyers celebrated the first Mass in the Mission Stone Church. The extremely hard times also made the life of the new parish difficult. Minnesota experienced three great challenges at this time: an economic depression, the American Civil War (1861-1865) and the war with the Dakota Indians. About 22,000 Minnesotans either served in the Civil War or in the war against the Indians. Many families faced financial difficulties due to the death of husbands/fathers or disablement of a husband/father. Between 1865-1890, there were practically no new Catholic families settling in the Cannon Falls area. However, a significant settler named Florian Carnel came in the fall of 1870 and bought Frank Wise's quarter section, 3 1/2 miles north of town on the Hastings road. He also became very involved in he Catholic Church and later was appointed a trustee at the same time as Michael Ford in 1882. During this period, when the Rev. W.T. Roy became the first resident pastor at Belle Creek, Cannon Falls and Cherry Grove became missions of Belle Creek. In succession, Fathers O'Reilly, Ansboro and McDevitt continued to serve the mission church until 1886 when Rev. Robert J. Fitzgerald took charge. In addition to these two missions, Father Fitzgerald also served Zumbrota. In order to increase revenue, pew rent started around 1885, ranging from $3.00 - $7.00 per year. During his pastorate, Father Fitzgerald received property for Calvary Cemetery in 1889. On May 24, 1889, the local paper cited the fact that nine teams (of horses) and a large group of men worked four days grading and leveling the ground of the new Catholic Cemetery. The Catholic community was pleased to have a place to bury their dead. The first burial in this new cemetery was that of James Dordan, Jr. on August 12, 1889 with Rev. R. J. Fitgerald officiating. The remains of some parishioners were transferred from the Bellwood Cemetery to Calvary Cemetery, now the present day St. Pius V Cemetery. After many years of growth, the congregation needed a larger building. In 1894, the foundation of the second church was laid on the corner of Fourth and Colvill Streets, just south of the first church. Again, stone from Limekiln Hill was used and also some cut stone from the Kesota quarry near Mankato. Archbishop John Ireland dedicated the church on February 25, 1895. Solemn High Mass followed the dedication, after which the ladies of the parish served a dinner for $0.25 per person. For a time, both churches stood side by side. However, in 1907, the pioneer stone church was demolished and on that site a rectory was built for the first resident pastor, Father McDermott. Finances being ever a growing concern, pew rents were increased: single pews - $10, side aisle pews - $20 and all remaining pews were $24 per year. Not until 1910 was electricity, running water, and a furnace installed in the rectory. In 1934, St. Pius V leased the northeast portion of the church's property to the Shell Corporation for a gas station. This station was demolished in 1977 providing more space for church parking. As the population of Cannon Falls grew, so did the needs of St. Pius V, especially the need for space. As the church basement was basically a cellar with dirt walls housing the furnace, the church's social functions were held at the American Legion Hall. Dishes had to be transported to the Legion Hall from storage in the rectory basement. 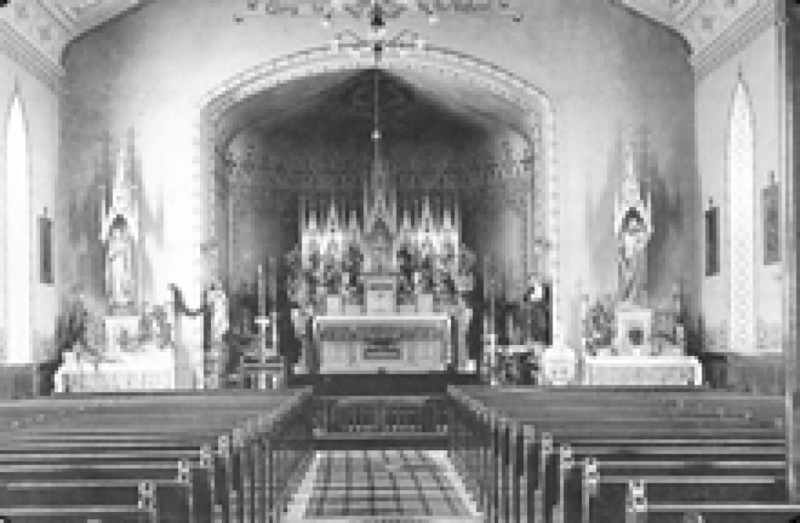 It became increasingly evident that a new church was needed, due to the increase in parishioners, lack of space, and also the deterioration of the building. Under the pastorate of Rev. G. Ross Bigot, a decision to build a new church was made in 1963. 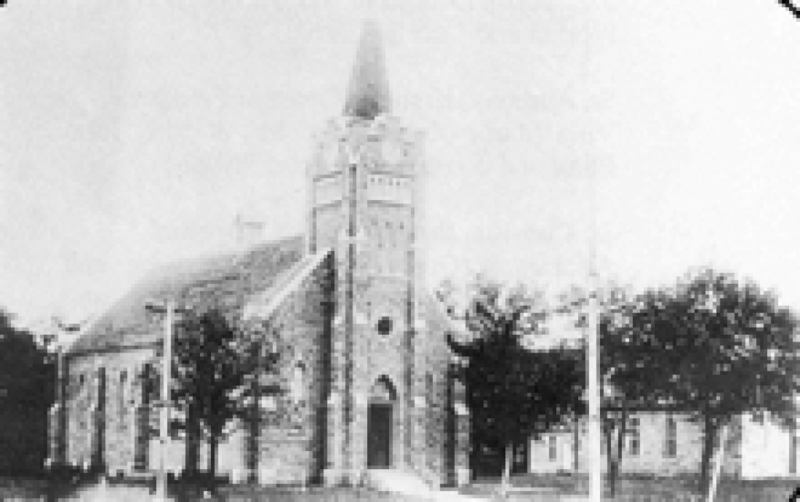 The old building was torn down in 1964 and groundbreaking for the present church took place on December 22 of that year. 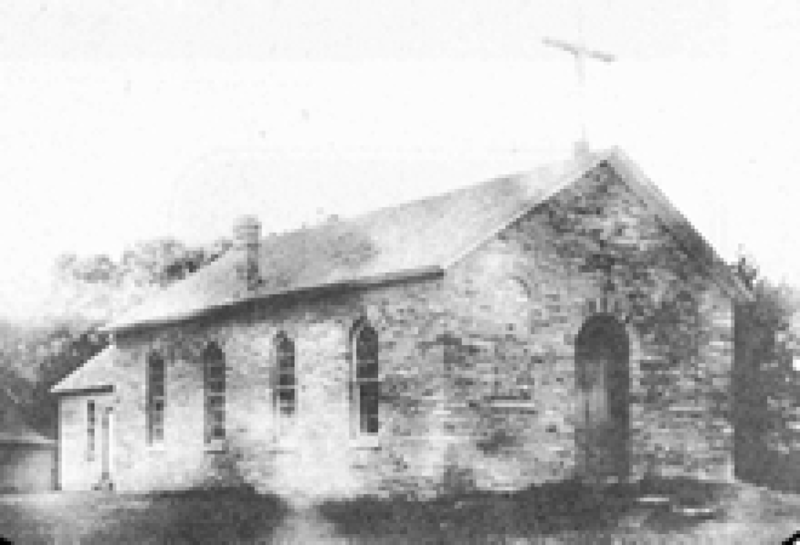 During the building period, Mass was celebrated in the Cannon Falls Community School gymnasium. The rectory was sold and moved to a new location in Cannon Falls. The current St. Pius V Church was made possible through donations, pledges and the bequest of the Henry Carnel Farm. (Henry was a son of Florian Carnel, an early parishioner. The first Mass in the new church was said on December 5, 1965. Dedication took place on May 5, 1966 with the most Reverend Archbishop Leo Binz presiding. Many parishioners donated items for the church, truly making the St. Pius V Church their own again. The Knights of Columbus donated the Campanile Bells. These bells were replaced in the fall of 1992 with a new set of Basilican Schelmerich Carillons that continue to ring at noon, three o'clock and six o'clock. In 1977, under the guidance of Father Bonin, stained glass windows within the church replaced the clear glass windows. These great accomplishments accommodated the parish for a time, until growth again demanded a response. 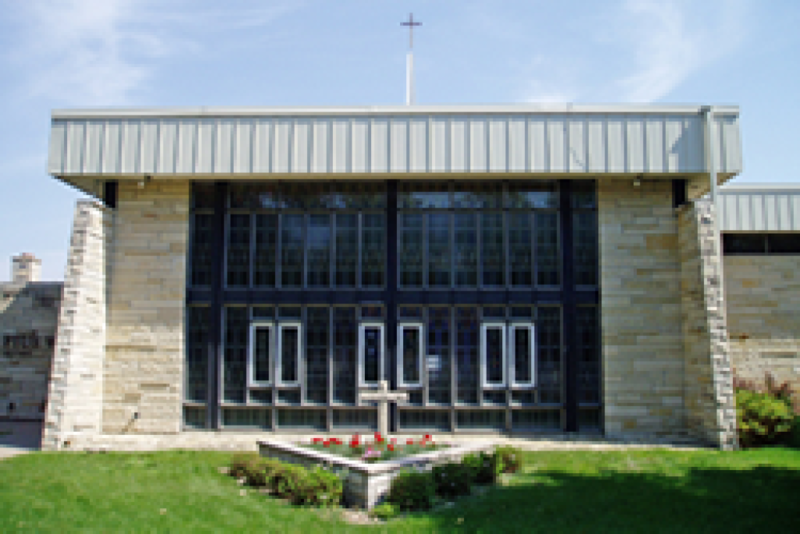 At the time of the dedication of the new church building in 1965, about 220 families called St. Pius V their parish. Ten years later, about 333 families worshiped, worked and learned about their faith in this growing church. A new addition was necessary. This addition completed in 1985 provided for extra classrooms, a new kitchen and some office space. In 2002, 523 families belong to the St. Pius V Community. Religious education is available for children/youth preschool - grade 12. The Knights of Columbus and the Council of Catholic Women (CCW) plus many other groups offer opportunities for service within the parish and to the community at large. In the fall of 2013, a new addition was added to the south side of the church with an elevator, handicap restroom and small meeting area. 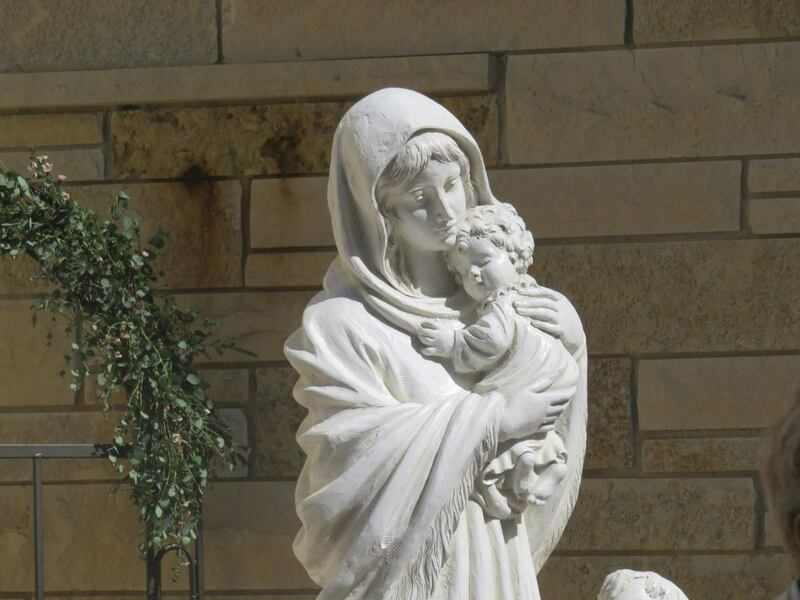 This new addition was blessed and dedicated on December 22, 2013 by Father Fernando Ortega. In June of 2014 Father Ortega obtained pews from a church in Minneapolis that had closed and had them brought to St. Pius V where the old pews were removed and these replacement pews installed. We are proud of the heritage handed to us through prayer, work and example. Some evidence of this example exists through the lives of the Religious Sisters and priests who had roots in St. Pius V. They include Sister Florian Carnel, Sister Cecelia Carnel, Sister Estelle Holland and Sister Regina Phelan (all sisters of St. Joseph); Sister Mary Anthony, OSU (Ellen C. Fling), Sister Mary Consilia, OSB (Grace Judge), Sister Mary Verona, O. P. (Ellen T. Ahern). Priests include Father John A. Phelan (ordained in 1927) and Father Paul G. Judge (ordained in 1943). They are deceased. Father David Barrett was ordained in 1996 and presently serves within our St. Paul/Minneapolis Archdiocese. A Marian Shrine was added in June 2015. 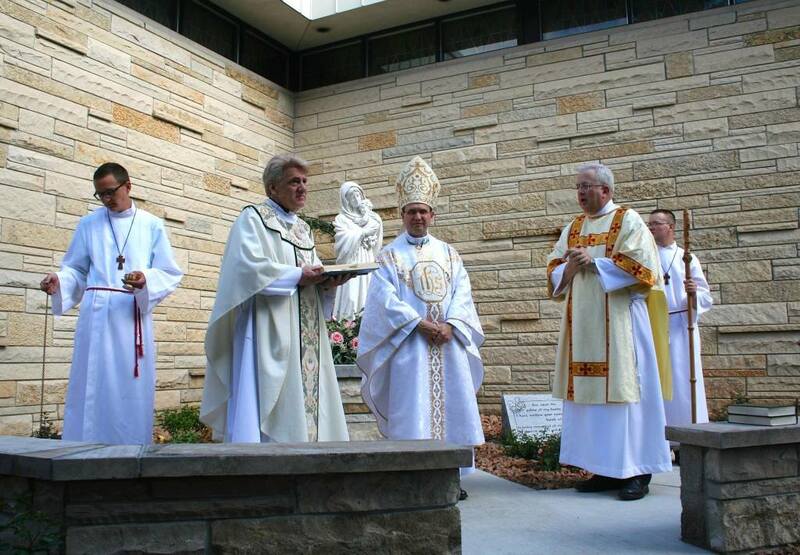 Dedication and Blessing of Mary our Mother Shrine with Bishop Cozzens, Father Beeson, and Deacon Kevin Downey. The founders of this parish with the spiritual leadership of the following priests endeavored to serve the Lord and each other. This is our heritage and direction in the 21st century as we together with people of all faiths continue to believe, work and worship.